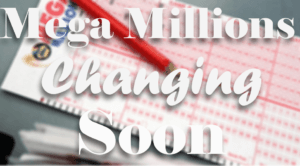 Just a heads up, in case you haven’t been keeping up with the lottery scene, there are big changes coming to Mega Millions on October 28, 2017. It’s the first time in a while since the popular lottery game will undergo any significant changes to its format—so it’ll be interesting to see how lotto players take to the new rules. In any case, the changes—for the most part—seem to be aimed at improving the overall Mega Millions experience. So, what can we expect with the new Mega Millions once it takes into effect next week? [h2 display=”Increased Ticket Prices” menu=”Higher Ticket Prices”] Mega Millions tickets will now sell for $2 each instead of $1 each. This change will probably irk some Mega Millions players out there, but some of the other changes being made to the lottery will make it worth the extra dollar. [h2 display=”Decreased Guess Range” menu=”Decreased Guess Range”] Currently, Mega Millions players chooses five numbers from a pool of 1-75, but with the rule change in effect, players will now have to choose five numbers from 1-70. If you’ve read my article on how lottery odds are calculated, this change in the guess range will definitely have an effect on Mega Millions’ odds (more on this later). [h2 display=”Increased Guess Range for MEGA Number” menu=”MEGA Number Guess Range”] While the guess range for the five main numbers will be decreased, the MEGA number’s guess range will now be increased. Currently, players choose one extra number from 1-15, but will have to choose from 1-25 once the changes take effect next week. [h2 display=”Odds of Winning” menu=”Odds of Winning”] As I’ve mentioned earlier, Mega Millions’ odds are changing as well. Thanks to the new mechanics, the odds will now be a bit longer. Your odds of winning the jackpot will now be 1 in 303 million, instead of the previous 1 in 259,890,850. Meanwhile, the odds of winning any prize will go from 1 in 14.71 to 1 in 24. The $1 million second-tier prize however, will feature better odds this time around—which will go from 1 in 18 million, to 1 in 12 million. [h2 display=”Prizes for Secondary Prize Tiers” menu=”Secondary Tier Prizes”] For some secondary prize tiers, Mega Millions will now offer higher prizes. For example, for a division 3 win (match 4 + 1), the prize will now be $10,000, while a division 5 win (match 3 + 1), will offer a $200 prize. [h2 display=”Bigger Starting Jackpot” menu=”Bigger Starting Jackpot”] It’s not just the secondary prize tiers that get a bump in prizes; the jackpot also gets improved. Starting next week, the minimum jackpot will not be $15 million anymore. Instead, jackpots will now start at a whopping $40 million! More than that, the redesign also comes with faster rolls. [h2 display=”What Does It All Mean?” menu=”What Does it Mean?”] So, what do all these changes mean for Mega Millions? Simply put, these changes should be able to provide a more fun, fresh, exciting, and—most important of all—lucrative lottery experience. These changes could very well pit Mega Millions against Powerball in terms of having some of the biggest jackpots on offer. Exciting times are definitely ahead, and I, for one, cannot wait for October 28! What about you?